Sometimes impulse shopping can be good! Grocery shopping on an empty stomach…never a good thing. Grocery shopping with a bunch of kids who all have empty stomachs, also not a good thing. At the end of the school year, the kids and I were power walking through Aldi’s, trying to pick up a few things to get us through the next bunch of days, but we were all hungry. There was lots of, “Can we get this? Oh…we haven’t had this in a while, can we get it….Oh Mommy I LOVE these, can we get them,” I’m sure you know how it goes. I mostly said no to many of the requests unless it was something I knew we actually needed. I try to keep my big grocery trip to a paycheck week only, and I knew that this could quickly get out of hand if I didn’t keep my kids’ requests to a minimum. However, one of the requests I said yes to was my daughter’s plea for Tortellini. We hadn’t had it in a while, I did need some meal fillers, and it looked good just in the packaging because it was tri-colored pasta. We threw not one, but two bags in the carriage and moved on. We passed the frozen shrimp section next. I love putting shrimp and pasta together so I threw one bag of that in the carriage also. I wasn’t sure what I would be doing with the items I was purchasing, but I couldn’t wait to get home and do Google search and see what came up. I didn’t just want to do plain old pasta and sauce. I’d done that in a pinch too many times this school year. 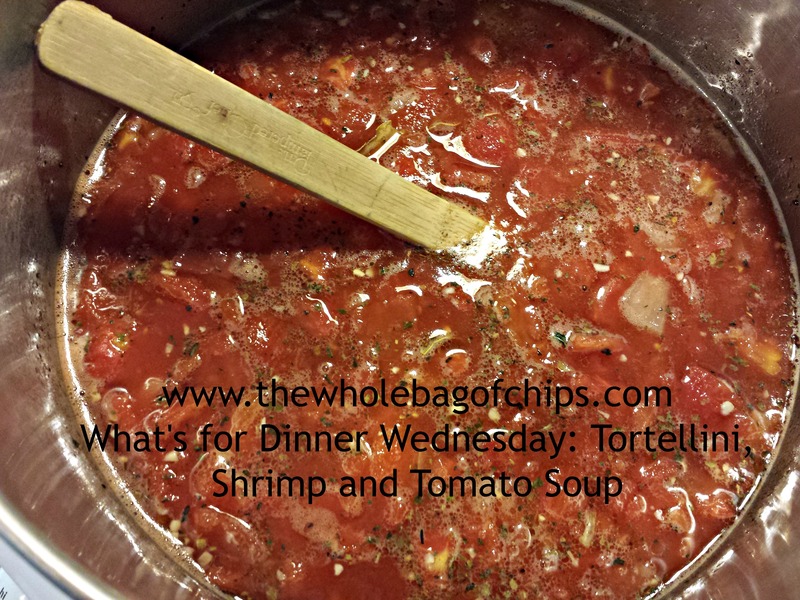 Sure enough, my Google search led me to a great recipe for Tortellini Tomato Soup. I knew I could add shrimp to that without a problem. Funny enough, one of my other daughters had been begging me to find a recipe for Tomato Soup that could equal the sample we’d had earlier this winter at Whole Foods. At $4.99 for a small jar it was a once-only treat for us, and I’d promised to find her a recipe to equal it or surpass it. The recipe I found, from Two Peas and Their Pod.com, was great. It didn’t take long to prepare and it had easy ingredients. I knew that I could throw the shrimp into the mix without a problem. The soup looked amazing as it cooked. Cooking time didn’t take very long at all and the ingredients were simple. In my house there are such a wide variety of tastes that it’s hard to please everyone. I knew that this recipe had the potential to work for everyone. 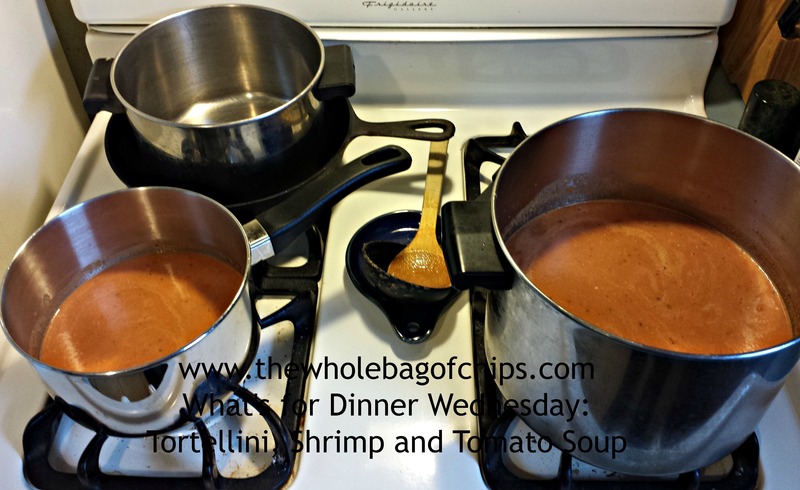 I could separate some of the soup before throwing in the pasta and shrimp, for those who wanted just plain tomato soup. Then, anyone who wanted tortellini and shrimp in theirs could have it (me) and anyone who wanted one or the other could do that too. There was definitely something for everyone with this recipe. I also threw the ingredients into my bread machine, a newly rediscovered toy this year, to make a French Bread to go along with our soup. The recipe on Two Peas and Their Pod showed the soup with a nice crusty bread, and I couldn’t get that image out of my mind when I was prepping my meal. It turned out to be a fabulously delicious dinner, and everyone was happy. I had enough leftovers of both the plain soup and the loaded soup to have lunch for a couple of days, and the bread was the perfect accompaniment to the meal. The use of Greek nonfat yogurt in the recipe made it ideal for our family’s dietary needs, as we have to stick to a pretty lowfat diet as much as possible. The soup was still just as creamy as it would have been had we used a heavier cream. I definitely would make this soup again, and I did indeed keep my promise of finding my daughter a soup that’d match the one she’d sampled in Whole Foods, and for a fraction of the cost of one small jar in their store. I have copied the recipe from Two Peas and Their Pod below, just as they have it on their site. I encourage you to pop on over to their site as well, they have lots of great recipes on there. This is not the first time I’ve visited it myself! 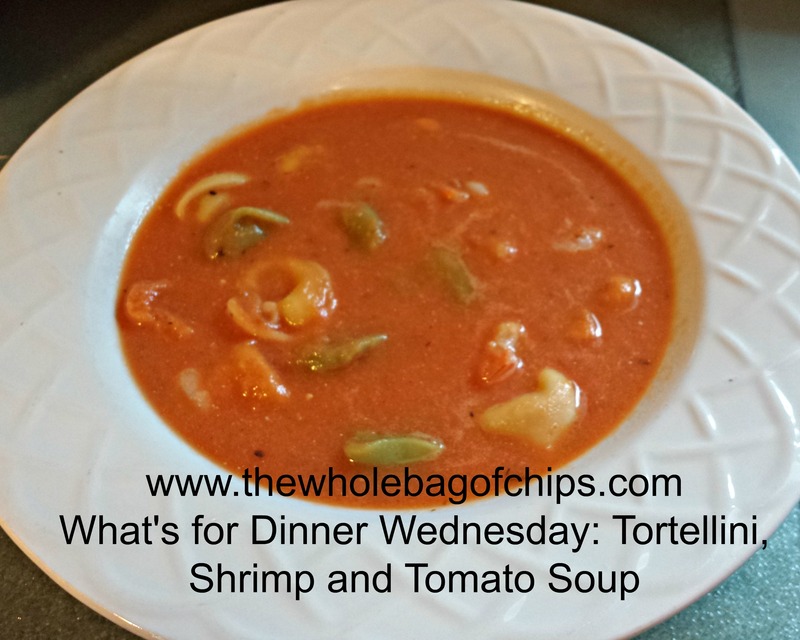 I was essentially able to make two soups with one recipe: one loaded with tortellini and shrimp, and one creamy tomato soup. 1. In a large pot, heat the olive oil over medium heat. Add the onion and garlic and cook until tender, about 5 minutes. Stir in the bay leaves and crushed red pepper flakes. 2. Add the diced tomatoes and vegetable broth. Stir in fresh basil and season with salt and black pepper, to taste. Simmer on low for 15 minutes. 3. Remove the bay leaves from the pot. Use a hand immersion blender to blend the soup (or carefully transfer soup to a blender to blend and return to the pot). Stir in the Greek yogurt until well combined. Stir in the cheese tortellini and cook on medium-low until tortellini is cooked, about 7-8 minutes. Serve warm.